Special Offers for a Limited Time - Don't Miss Out! 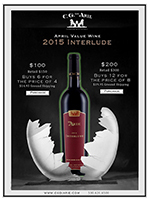 Any questions, contact us via email info@diariewines.com or tel 530-620-6500. * CG DiArie reserves the right to substitute wines on orders not picked up within 60 days if a vintage has sold out. 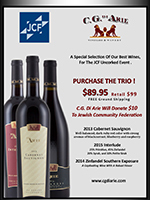 Jewish Community Federation Trio "3 Great Products In One Package!" "3 of our best products in one package!"